"This dessert is one of my favorites. Although you have to put a little work into it, the results can be described with one word: Yummy!" EASY!! Since now is not the time for fresh peaches, I used can. I'll make again because it was so easy & it doesn't have all the calories of using a pudding. May try other types of fruit. Loved it! Thanks for sharing!! I added a couple layers of blueberries and chopped pecans to add some crunch! 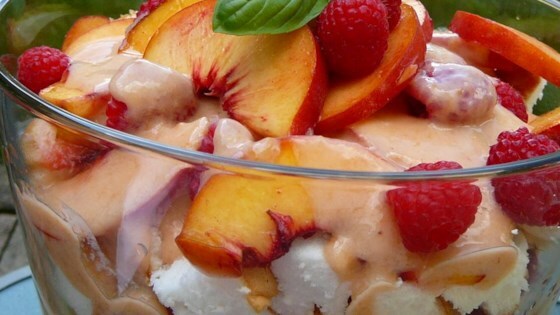 This recipe was very easy and was a great way to use fresh peaches! It was delicious! Great trifle! Easy to throw together for unexpected guests. Followed the instructions exactly and ended up with a great summer dessert.